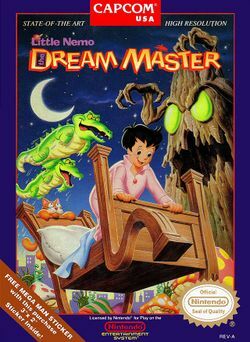 Little Nemo: The Dream Master (known as Pajama Hero Nemo (パジャマヒーロー NEMO, Pajama Hīrō Nīmō?) in Japan) is a platformer released on the NES in 1990 by Capcom. It is based on the Japanese animated film, Little Nemo: Adventures in Slumberland, which itself is based on the comic strip Little Nemo in Slumberland by Winsor McCay. The game's music was composed by Junko Tamiya, credited in the game as "Gonzou". The game revolves around a small boy in his own surreal dreams as he journeys to Slumberland. Nemo can ride certain animals such as a frog, a gorilla, or a mole, by feeding them candy. Each animal has its own skills needed to complete each level. The purpose of the game is to travel to the Nightmare land to rescue Morpheus, the king of Slumberland, from the clutches of the evil Nightmare King. This page was last edited on 28 December 2009, at 17:15.